Now you can experience the flavors of Greece in your own backyard with these Mediterranean grilled burgers. 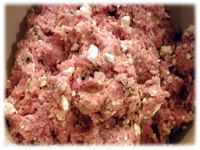 Using all ground pork we blend in authentic flavors of lemon, oregano and feta. 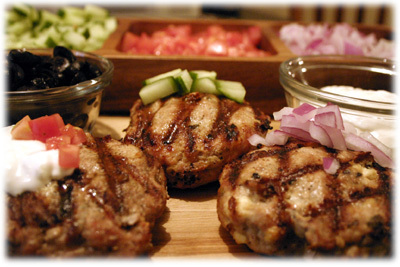 Once they're grilled top these juicy burgers with diced cucumber, tomato, red onion, black olives and a traditional Tzatziki, a cool blend of cucumber and yogurt found at most supermarkets. Or you can try our own cool cucumber sauce found here. Because these burgers are 100% spiced ground pork they stay very juicy and full of flavor from the grill to your table. 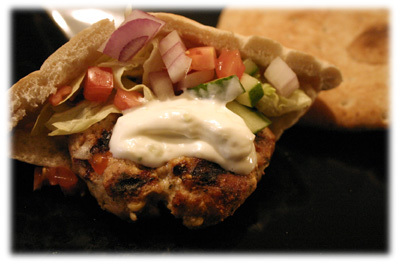 If you're feeling adventurous try using pita pockets instead of regular buns when the burgers are grilled. 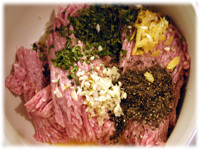 In a large mixing bowl combine the first 9 ingredients. Wet your hands with a little water and mix the ingredients together. Don't over-mix or you run the risk of making tough burgers. Add the 1/2 cup crumbled feta cheese to the bowl. 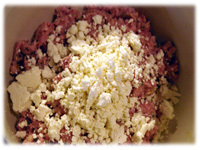 With wet hands blend the feta cheese into the burger recipe. Don't overwork this mixture, just ensure all ingredients are fairly well distributed. Lightly shape approx. 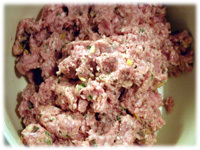 3/4 cup of the burger mixture into patty shapes but don't overwork the meat. 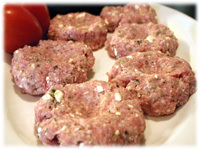 Make a slight indentation in the center of each patty to allow for expansion while grilling. Makes approximately 6 patties. Cover and refrigerate 30 minutes to an hour to allow flavors to blend. 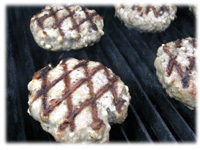 Always cook hamburger recipes cold from the refrigerator, they hold together better on the grill. Also, have at least 1 cup of traditional Tzatziki or cucumber sauce on hand to serve on top. Clean and oil the BBQ grates. Preheat the grill to 500F - 525F and for direct heat cooking. Tip: Always keep the lid closed unless adding, moving or removing the food. When BBQ has reached temperature place the burgers on the grill. 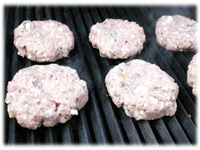 After approximately 4 - 5 minutes rotate the burgers about 30 degrees for diamond grill marks on the patties. After another 4 - 5 minutes lift the lid and flip the burgers. Look for a grilling pattern like this picture. 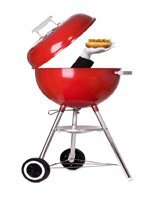 Grill for another 4 - 5 minutes and then rotate 30 degrees. After another 4 - 5 minutes these grilled burgers should be ready to remove - if using an instant read thermometer look for an internal temperature of 160F. Remove to a cookie sheet lined with paper towels that has a cooling rack on it. Cover and let sit 5 minutes before serving. Serve the grilled burgers with Tzatziki, diced Roma tomatoes, diced cucumber, diced red onion, shredded lettuce and sliced black olives. Also, try using Pita Pockets instead of regular hamburger buns.